square miles, is shallower than 130 feet at low tide. Much of this area lies atop Stellwagen Bank, but also includes southern Jeffreys Ledge and the top of Sanctuary Hill. Diving offshore is unlike diving at a similar depth inshore. In addition to the deep water, you will likely experience strong currents at the surface and the bottom, especially if the wind and tide are moving in the same direction. Plan your dive around slack tide for the best underwater and surface conditions. Click here for a list of dive charters that may have trips to the sanctuary and its surrounding waters. Recreatonal SCUBA Diving Opportunities in the Sanctuary. Stellwagen Bank is a glacially deposited sand and gravel feature created by the retreating Laurentide Ice Sheet that covered much of New England during the last period of glaciation. Approximately 10,000 years ago, Stellwagen Bank rose above sea level. Archaeological research may one day find prehistoric human, animal, or plant remains. 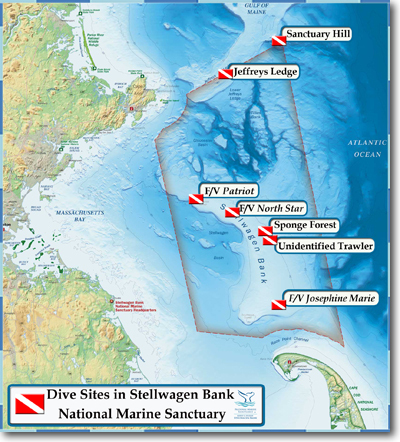 Stellwagen Bank's shallowest depths are at its southern end, which rises to within 65 feet of the surface. In this area, the sandy bottom is pockmarked with lobster holes. Moving north along the bank’s top, the seafloor slopes to a relatively constant depth of 100-110 feet. While diving the bank’s sandy areas offers the opportunity to view schooling fish, areas with hard bottom habitat will likely prove more rewarding to visit. One such dive site, named Sponge Forest, encompasses areas with cobble and scattered boulders that provide hard substrate for encrusting marine invertebrates. The area is named after the large finger sponges found growing on the seafloor. Sponge Forest lies within the Traffic Separation Zone of the Port of Boston’s Traffic Separation Scheme (TSS). Dive vessels must be on the lookout for large cargo vessels transiting the area and must not impede the passage of these vessels. Vessel operators should follow all regulations pertaining to the safe operation of vessels in a TSS. Jeffreys Ledge is a large glacial remnant, stretching 33 miles from offshore of Rockport, MA to Cape Elizabeth, ME. On the northern edge of the sanctuary, rocky ridges on the southern edge of Jeffreys Ledge rise to within 115 feet of the surface. The shallowest portion of the ledge is comprised of piled cobble and boulders. Anemones, stalked tunicates, and coralline algae reside on the rocks making for a colorful landscape when illuminated with a dive light. The ledge’s piled boulders create a complex structure with many crevices for marine fishes like cusk and wolffish. In the sanctuary's northeast corner, Sanctuary Hill rises from 325 feet to 115 feet and is topped with solid granite and piled boulders. Like Jeffreys Ledge, the hill’s hard substrate is home to a variety of invertebrates and fishes that live on and in the piled boulders. Since Sanctuary Hill is 18 nautical miles offshore, the bedrock outcropping experiences very strong currents. Reportedly, blue and porbeagle sharks visit areas with steeply sloping topography like Sanctuary Hill. The fishing vessel Josephine Marie lies on the southern end of Stellwagen Bank in 105 feet of water. The 80-foot long steel-hulled stern trawler was built in 1969 by the Bender Welding and Machine Company, Inc. of Mobile, Alabama. Based in Gloucester, the Josephine Marie actively fished in Massachusetts Bay until 1 February 1992 when disaster struck. While returning from a routine fishing trip, the Josephine Marie’s crew radioed the Coast Guard that they were taking on water and needed immediate help. The trawler's crew abandoned ship and were rescued by the F/V Italian Gold. The red and black-hulled Josephine Marie lies upside down with its bow facing roughly southeast. Divers should be aware of hazards such as strong currents and entangled fishing gear. The Josephine Marie in Gloucester. Courtesy of John Harper. An unidentified trawler shipwreck rests on Stellwagen Bank in 105-110 feet of water. The trawler is broken into four pieces; its pilothouse, hull, stern, and net reel. 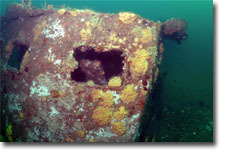 Smaller hull fragments surround the site. As the shipwreck sits on a mostly featureless sand bottom, it attracts schools of cod and pollock that hide within its structure. The identity of this trawler has not been determined and the sanctuary is seeking help from anyone who might know its name. 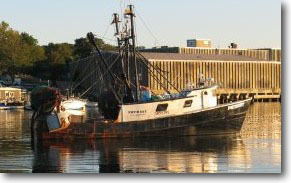 The trawler lies within the Outbound Lane of the Port of Boston’s Traffic Separation Scheme (TSS). Vessel operators should follow all regulations pertaining to the safe operation of vessels in a TSS. The vessel’s wheelhouse has unusual small rectangular windows. Courtesy of Heather Knowles, NADE. The fishing vessel North Star lies on the northern end Stellwagen Bank in 100 feet of water. 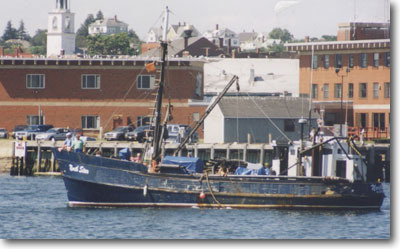 The 55–foot long wooden hulled eastern rig vessel was outfitted for clam dredging when in sank in 2003. The wreck consists of three main pieces: clam dredge, lower hull and engine, and deck machinery. The fishing vessel North Star in Gloucester, Mass. Courtesy of Parker Collection, Maritime Gloucester. The fishing vessel Patriot lies near Stellwagen Bank’s Northwest Corner on its starboard side in 100 feet of water. The 62–foot long steel hulled dragger sank while fishing in 2009. The wreck is now home to schools of cod and pollock. Divers should be on the lookout for entangling fishing nets. Please do not disturb the shipwreck as two fishermen perished when it sank. The fishing vessel Patriot departing Gloucester, Mass. Winter storms moved the Patriot and it has not been relocated; however, it is suspected to be nearby the geographic coordinates listed below. When you’re planning a dive on Stellwagen Bank, use the tide station at Boston Light or Race Point to provide an estimation of slack tide. Experience has shown that slack tide on Stellwagen Bank usually occurs 30 minutes before high or low tide is indicated at the tide station. Slack tide for Jeffreys Ledge and Sanctuary Hill is best indicated by the tide station at Rockport. Make sure to fly both the Divers Down flag and the Alpha flag to indicate to other vessels that divers are in the water as sanctuary waters are quite busy. The sanctuary is home to a broad variety of marine life and the animals you will see depends upon the environment you visit. In the sand and gravel areas on top of Stellwagen Bank you're likely to see a smattering of encrusting organisms such as sponges, tunicates, and anemones. Mussels, clams, scallops, moon snails, and whelks are common. 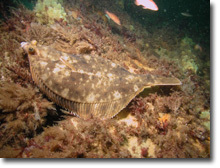 Fish life includes sculpins, skates, flounders, goosefish, and cod. Schools of dogfish, herring, pollock, and sand lance make dives on top of the bank particularly exciting. When diving on the rocky ridges and boulder fields you will encounter a greater variety and density of encrusting invertebrates, in often spectacular color. Look under boulders and in crevices for wolf eels or ocean pout. Many of the fishes seen in the sand and gravel areas also frequent boulder and rocky areas. While ascending and descending, keep a lookout for blue sharks, tuna, and ocean sunfish, as well as several varieties of jellyfish. Once back on the boat warming up after your dive, look for humpback, minke, or finback whales. It is also possible to spot ocean sunfish and basking sharks.